FTC Disclosure: I received a copy of this book from the publisher in exchange for my honest review. Thanks to Dutton Books, I had the opportunity to read something a little outside my norm - a book on science & philosophy, proposing a unified theory of physics and the meaning of life. "The Big Picture: On the Origins of Life, Meaning, and the Universe Itself" came out this past Tuesday, May 10, and tackles a big subject matter in a fairly approachable way. Carroll, a CalTech physicist and ardent atheist, has developed a theory of the world that he calls poetic naturalism. This theory takes naturalism, the idea that the laws of nature are all there is in the world (i.e. no supernatural/other realm), and adds the additional gloss that for there only being one world, there are many ways to describe it and how we choose to do so matter. That gloss is the "poetic" part. In Carroll's own words, "Poetic naturalism strikes a middle ground, accepting that values are human constructs, but denying that they are therefore illusory or meaningless...The meaning we find in life is not transcendent, but it's no less meaningful for that." To develop this theory, he provides a primer on the development of key scientific theories and thought, from basic physics with Newton and Einstein (and even further back) to modern quantum physics. For the most part, Carroll succeeds in making his theory accessible to readers. He does a fantastic job laying out the context and scientific developments throughout history that have brought the scientific community to its present theories and understanding. I could follow along and understand his argument without needing to Google much. There were, though, a few points were he presumed a basic level of scientific understanding or agreement with scientific methods that did not seem adequately developed. For example, he tosses around the term "spacetime" in the first part of the book without adequately explaining what it means. I had some ideas from Dr. Who, but I'm guessing that's not exactly what he meant, and had to read a bit on Wikipedia before I could continue. More broadly, Carroll's base level of inquiry seems to be primarily what is useful to a scientist attempting to understand the world around him or her. That viewpoint makes sense given his life's work, but lay readers searching for a life's meaning in a different personal context may not be wholly convinced by his theories and arguments. Nonetheless, it's an engaging read, and readers will walk away with a better understanding of physics, irrespective of their personal views on the meaning of life. Verdict: Jury's Out - if you have a basic level of understanding of science and a general interest in philosophy informed by science, definitely check this out. If that's not the lens through which you view the world, you may still learn a good chunk about science from this book, but you're not likely to be convinced by the unifying theory. 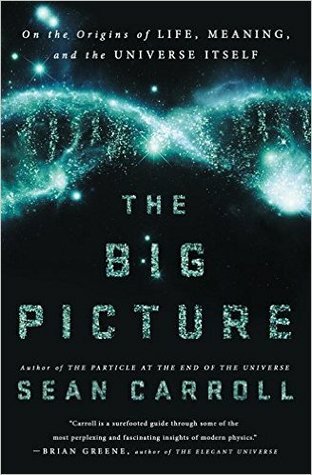 "The Big Picture: On the Origins of Life, Meaning, and the Universe Itself" by Sean Carroll, published May 10, 2016 by Dutton Books.